mother nature, including Turmeric, Bromelain, Papain, Boswellia, Rutin, Ginger, and more! 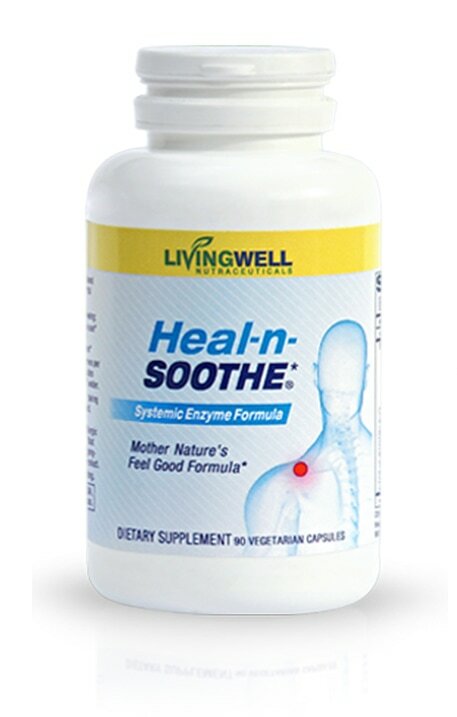 TRY A BOTTLE OF Heal-n-Soothe® FOR FREE! For a limited time, new customers can get a FREE 30 day supply (90 count) of Heal-n-Soothe® when you sign up for our monthly smartship program. We will mail you a 30 day supply of Heal-n-Soothe® for only $59.95 per bottle. Plus, we will ship it to you for free! Then, after the trial period, we will deliver your refills every 30 days at just $59.95 per bottle. You may cancel at any time and for any reason with a simple email or phone call to us! This video player is not support on your device. We apologize for this inconvenience. It's called Systemic Enzyme Therapy and it has been used in numerous countries throughout the world for over 50 years. The word systemic means “whole body,” as systemic enzymes operate throughout your body in every system and organ. Enzymes are known as biocatalysts - something that makes something else work or work faster. 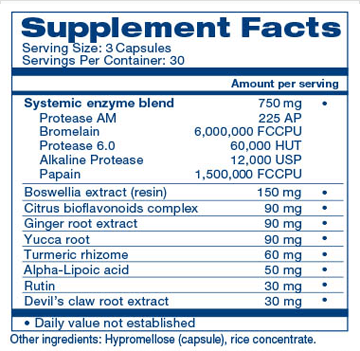 Enzymes are your body’s first line of support when it comes to staying healthy, fit, and active. Enzymes are NOT anti-inflammatory drugs but rather help support a healthy inflammatory response, which can have a positive impact on overall joint comfort, flexibility, and mobility. Having balanced levels of inflammation-causing substances is also important for maintaining a healthy heart, a healthy brain, and for keeping your joints feeling young and spry. 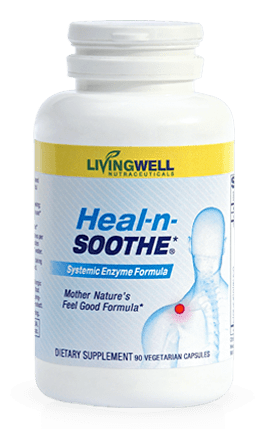 In addition to the enzymes, Heal-n-Soothe® contains 12 powerful extracts found in mother nature, including Turmeric, Bromelain, Papain, Boswellia, Rutin, Ginger, and more! You can see the full list of ingredients below. Research indicates these enzymes work throughout your entire body to help it break down and eliminate the excess proteins that accumulate at the scene of an injury, irritation or burn. This promotes wound healing, supports healthy circulation and helps maintain a normal immune response. Another time-tested natural pain defender, Devil's Claw has been used for hundreds if not thousands of years in Africa. It supports healthy COX-2 activity and there is evidence that Devil's Claw can help improve joint discomfort. Citrus bioflavonoids support healthy cartilage, the main connective tissue in the body that keeps your joints moving smoothly and freely. The key ingredients in Heal-n-Soothe® have been proven to be highly effective in numerous clinical studies. For example, in one study, 77 patients taking 400mg/day of Bromelain experienced significant improvement in joint discomfort. A recent study done at the prestigious Sloan-Kettering Cancer Research Center in New York suggests Turmeric can help promote healthy COX-2 activity (COX-2 is your body’s “pain enzyme”), but with less likelihood of gastrointestinal issues common to other common joint health solutions. Heal-n-Soothe® is a proprietary blend of proteolytic enzymes and ingredients that have been used in many ancient civilizations for centuries to leave joints feeling comfortable. We are so confident in Heal-n-Soothe® that we are willing to refund your money if it doesn't. That's right… you can try it and all the risk is on us. After trying it for at least 2 weeks, simply let us know and we'll gladly refund all of your money (excluding shipping). 1 Biomed Rep. 2016 Sep; 5(3): 283–288. 2 Evid Based Complement Alternat Med. 2004 Dec; 1(3): 251–257. 3 Foods. 2017 Oct; 6(10): 92. 4 J Immunotoxicol. 2016 Jul;13(4):590-602. 5 J Biomed Biotechnol. 2010; 2010: 197898. 6 Planta Med. 2006 Oct;72(12):1100-16. 7 EXCLI J. 2015; 14: 59–63. 9 Integr Med Insights. 2016; 11: 11–17. 10 Arthritis Rheum. 2001 Nov;44(11):2531-8. Please understand that our Customer Service Representatives are not qualified to answer any medical questions. Q: How often should Heal-n-Soothe® be taken? Q: Is Heal-n-Soothe® made with any animal product? Q: Can I take Heal-n-Soothe® with other medications? Q: Who should not take Heal-n-Soothe®? Q: How long should I take Heal-n-Soothe®? A: Heal-n-Soothe® can and should be taken along with your multivitamin for as long as you want. WARNING: Persons who suffer from medical conditions or who are taking medications should consult their physician prior to taking this product. This product may thin the blood and may not be appropriate for all persons. Do not take this product if you know or suspect that you are allergic to pineapple, papaya, or any ingredients in this product. As with all dietary supplements, those who are pregnant or nursing should consult their physician prior to taking this product. This agreement applies to all Healthy Back Institute (“HBI”) materials (whether enclosed or on HBI’s website) and HBI services (jointly referred to as the “System”). By opening this package or using the System, you are agreeing to be bound by the terms of this agreement. If you do not agree to the terms of this agreement, you may return this package unopened for a full refund. Who we are: HBI is a publisher of information for educational purposes only. HBI is not a licensed medical or health care provider and does not employ licensed medical physicians, nurses, dieticians, nutritionists or other medical or health care service providers. HBI is not affiliated with any medical or other health care institution. Lose the Back Pain System: HBI publishes materials under the title “Lose the Back Pain” which includes a video, a reference manual, and a personal support service. These three components make up the “System” and all components are offered subject to this disclaimer. Neither the System nor the System materials or content have been approved by the Food and Drug Administration, the Federal Trade Commission or any other government agency. You understand that the System support services are not designed or intended to offer emergency medical care or response services. What we do and don’t do: HBI’s System offers general information about maintaining a healthy body and particularly the types of exercises which are commonly believed to support a healthy back. However, each person is unique and the information included in the System may not be appropriate for your specific health or back situation. HBI does not give medical advice or opinions on medical conditions, treatments or cures; and you should not rely upon anything in the System or System materials as a preventive, cure or treatment for any purposes. Any information in the System or System materials that appears in the form of an opinion, recommendation, preventive, cure or treatment should NOT be taken as medical or other advice even if it may appear to you as such. HBI strongly recommends that you check with a licensed physician who is familiar with the details of your particular situation before you begin using the System or the System materials. Content, Currency and Results: The System and System materials are published as of a certain date and may become out of date after a period of time. HBI recommends that you always check with HBI for new editions or versions of any printed System materials you have had but not used for a while to be sure you have the most current System materials. HBI PROVIDES THE SYSTEM AND SYSTEM MATERIALS “AS IS” WITHOUT WARRANTY OF ANY KIND, EITHER EXPRESSED OR IMPLIED, INCLUDING, BUT NOT LIMITED TO, THE IMPLIED WARRANTIES OF MERCHANTABILITY, FITNESS FOR A PARTICULAR PURPOSE, NON-INFRINGEMENT, OR RESULTS. Each person’s results will be unique and you may not achieve the results of others. results may and do vary. HBI MAKES NO WARRANTIES ABOUT THE ACCURACY, RELIABILITY, COMPLETENESS, OR TIMELINESS OF THE SYSTEM OR SYSTEM MATERIALS OR SERVICES, WEBSITE, TEXT, ILLUSTRATIONS OR GRAPHICS. HBI DOES NOT WARRANT THAT ITS SYSTEM WEBSITE WILL OPERATE ERROR-FREE OR THAT ITS SYSTEM WEBSITE AND ITS SERVER ARE FREE OF COMPUTER VIRUSES OR OTHER HARMFUL MECHANISMS. IF YOUR USE OF THE SYSTEM WEBSITE OR SYSTEM MATERIALS RESULTS IN THE NEED FOR SERVICING OR REPLACING EQUIPMENT OR DATA, HBI IS NOT RESPONSIBLE FOR THOSE COSTS. Your responsibility: Your health is your responsibility. Your use of the System is your choice and will be at your own risk. The System and System materials are not intended to offer you all information about maintaining a healthy body and back. There are many options and alternative courses of action that may be equally or more beneficial to you. Depending upon your specific health situation, the System and System materials may be detrimental to your health. Exploring all of the options and alternatives is your responsibility. The System and System materials include illustrations and demonstrations of how to perform certain exercises that may involve household items such as chairs, doors, and that may also include the use of elastic bands, balls, mats and other equipment or items. You are responsible for the condition and your use of all these materials should you decide to incorporate them into a routine of your choosing. Although HBI recommends certain equipment and other items for your use, HBI cannot guarantee that they are suitable for your specific situation. Your selection and use of any equipment will be your sole responsibility. Descriptions of, or references to, products or publications does not imply endorsement of that product or publication. The content of all advertisements appearing in the System materials is the sole responsibility of the company placing the ad. HBI does not endorse either the accuracy or reliability of the content of the advertisements, or of any products connected therewith. Limitation of Liability: HBI and its parent, subsidiary and affiliated companies and their respective directors, officers, employees, advisors, agents, licensors, and other contributors will not be liable for any injury, harm or death you or others may suffer as a result of the use or attempted use of the System or any materials in the System, whether or not such use is in accordance with all System instructions or other directions. HBI will not be liable for any indirect, consequential, special, incidental or punitive damages related to the System or System materials or any errors or omissions related thereto. HBI maximum liability for any claim based upon the System or System materials is limited to the retail price of the System as of the date of publication of the version or edition. Because some states do not allow the exclusion or limitation of liability for consequential or incidental damages, the above limitation may not apply to you. The Website provides free access to articles that address health and fitness topics in various categories such as Diet & Weight Loss, Exercise & Fitness, Diseases & Conditions, Nutrition & Supplements, Women’s Health, Men’s Health, Senior’s Health and Children’s Health. It also offers health-related products and a public discussion forum where users may post questions and receive responses from HBI or a third-party information provider. The Website also offers users the opportunity to create a private HBI membership account that enables users to access additional information and services. HBI may from time to time change or remove Website content, categories and services in its sole discretion. Although the Website may offer information about children’s health, it is designed for use by adults only. Parents may use the Website to obtain information that may be relevant to their child’s health condition. Parents who create or allow their child to create a Website membership account will be solely responsible for supervising their child’s use of the Website. Depending on the user’s interaction with the Website, HBI may collect user information that falls into the following categories: Non-Personal Information, Personal Information, and Personal Health Information. Non-Personal Information (“NPI”) is information that is not associated with a specific user and that does not enable HBI or others to identify a specific user. For example, a user’s age, gender, city and state of residence, when not associated with any other information that could help identify the user, like street address or telephone number. NPI may be collected when users visit the public portion of the Website without registering as a member. Personal Information (“PI”) is information that identifies you as a unique person. For example, your first and last name associated with your street, city, state and zip code or telephone number or email address or other information that identifies you personally. PI is collected when users voluntarily register to be a member of the Website and may be collected when a user sends an email inquiry to HBI via the Website or otherwise. Personal Health Information (“PHI”) is Personal Information coupled with information about your personal health such as a particular disease or other health condition. It is collected when users voluntarily provide both PI and their personal health information via the Website or otherwise. You are responsible for the accuracy of all PI and PHI that you submit to HBI, whether via the Website or otherwise. HBI is not responsible for verifying the accuracy or currency of your PI or PHI. You understand that any information and/or services offered via the Website relevant to your personal situation may be based upon your PI and/or PHI, and that your PI may also become important for HBI to contact you. Therefore, it is important for your PI and PHI to be accurate and current. It is particularly important for your email address to be current because HBI will use email as its primary means of communicating with Website members and other users who have voluntarily provided PI to HBI. User information may be collected in various ways. NPI may be collected via web-based technologies that track computer usage. For example, every computer that accesses the Website will be assigned an electronic file with a unique code or identifier often referred to as a “cookie” unless the user’s browser has been configured to block this type of activity. Cookies and other technologies may be used to collect information about each user’s navigational activities and selection of advertisements, sponsored links, and other similar NPI. PI and PHI may be collected via the Website’s membership registration process, user emails, and other similar means when a user voluntarily provides it. PI and PHI is not collected via the Website unless the user voluntarily submits it to HBI. HBI will not share PI or PHI with any third-parties without the user’s consent with the following exceptions: (i) HBI may have to make incidental disclosures to third-party vendors who are providing technical or other services to or on behalf of HBI, including web hosting, software and hardware maintenance service providers (however HBI will endeavor to have all vendors sign appropriate confidentiality agreements in these circumstances); (ii) when compelled by legal requirements such as a court order, subpoena, search warrant, applicable law or the like; and (iii) under special circumstances that may involve a health or other physical threat to you or others or to protect, defend or otherwise assert legal rights. You may update your PI and PHI via the Website or by writing to HBI at 333 Main Street, Suite 201, Gaithersburg, MD 20878. When writing, please include your full name, address, membership account number, and the information that you would like updated. If you have a complaint or other issue, please contact HBI initially via our Customer Support link. Upon receipt of your written specific request, HBI will delete your PI and PHI from its databases, and, to the extent reasonably possible, from its back-up media. HBI will have no obligation to store your PI or PHI for any duration of time after termination of your Website membership. Absent your written instruction to the contrary, HBI may, in its discretion, retain and use your PI and PHI after termination of your membership. This statement has not been evaluated by the FDA. This product is not intended to diagnose, treat, cure, or prevent any disease. WARNING: Persons who suffer from medical conditions or who are taking medications should consult their physician prior to taking this product. This product may thin the blood and may not be appropriate for all persons. Do not take this product if you know or suspect that you are allergic to pineapple, papaya, or any ingredients in this product. As with all dietary supplements, those who are pregnant or nursing should consult their physician prior to taking this product.